About a month before I headed home from school for the summer, the nagging that I was dreading, but knew was going to come eventually, started. My parents started to unfailingly remind me every day that I needed a job for the summer so I didn’t spend my days at home watching Netflix for hours. I highly doubted I’d get hired anywhere when I’d only be able to work for three months, max; but I did actually find a place that would take me-Chipotle. Ever since working there, I’ve realized the immense success and the almost cult-like affection some customers feel for the place. Some of the reason for their success, I believe, is through the company’s smart advertising and marketing of the brand. Mostly, Chipotle capitalizes on what makes it unique. Sure, it’s technically a fast food restaurant, but most people consider it an upper-tier fast food restaurant. Why is this? Because they make sure they advertise what makes them different from other places, emphasizing in their logo how their products are “raised responsibly”. According to the Chipotle website, they use all naturally raised meat from farms that meet their high standards, rBGH-free cheese and sour cream, and CEO Steve Ells even testified before Congress to try to eliminate the use of antibiotics in ranching. They don’t advertise often, but are effective in getting this message across in the ads that they do put out. The biggest example of this is their 2-minute critically acclaimed commercial featured during last year’s Super Bowl which captured many people’s attentions across the country. The sweet and simple commercial entitled “Back to the Start” featured a cartoon farmer deciding to industrialize his simple farm, forcing the cartoon animals into cramped buildings instead of letting them roam and graze. After realizing the error of his ways, the commercial shows him taking down the walls and buildings and converting his farm back to the way it was in the beginning. 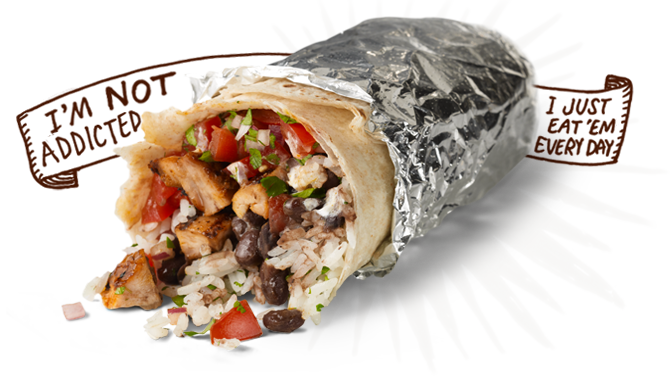 The commercial gained the company plenty of positive attention, and made many (including myself) see why Chipotle was different than other fast-food places. The company also realizes that one of the keys to success is emphasizing good customer service and having high standards for their employees, higher than most other fast-food restaurants. Our communication with customers is essential and they always make sure that we make the experience pleasant for the customers so they will be sure to return time after time. It has given me some very good experience in learning to converse with customers even when it’s very busy and when facing difficult situations, something I’m sure I will find useful when I’m aiming to get an internship in the communications/PR field and when I’m trying to get a job in that field as well. While sometimes I may complain about how busy it can be at my job, it’s actually taught me some pointers about effective PR, advertising, and marketing and what can help make a company popular. Chipotle’s ads, commercial, logo, and even the witty sayings on the back of the shirts us employees have to wear capitalize on what makes it unique, and has contributed to making this relatively new chain so successful.